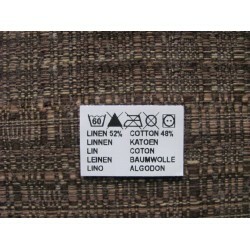 Textile labels with Your wanted information: logo, company name, contact data, item size, item care symbols and instructions, item containment, etc. These labels are manufactured after agreement of the layout. Labels with Your information There are 12993 products. Cut textile labels with Your custom information. White nylon, printed in black. Price is for 100 pcs. Please fill-in the label customization form below and press the "save" button before adding to cart. 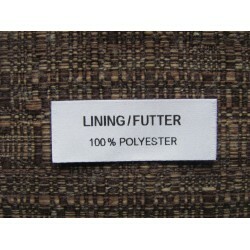 Cut textile labels with Your custom information. White satin, printed in one colour. Price is for 100 pcs. Please fill-in the label customization form below and press the "save" button before adding to cart.